The flowers are blooming, the weather is warming and our thoughts turn to the festive season and getting ready for the ‘big day’. It’s not quite the traditional European celebration of the northern hemisphere Christmas, but we still look to a lunch that makes our belt buckles groan under the pressure of too much tucker, a tree that’s bedecked with all things shiny, and music that gets us into a celebratory mood. Seeing as we ‘down under’ have our very own mix of the snowy postcard and ‘Aussiefied’ Christmas, why not have our music fit the mold too? Martin Cilia’s Electric Christmas fits the bill very nicely thanks. A listen to this festive musical feast will have you acknowledging Cilia’s title of ‘Australia’s premier surf rock guitarist’ and tapping along to twelve jolly Christmas tracks. Three of the instrumental pieces are Cilia’s own (‘Christmas In July’, ‘Christmas Stomp’ and ‘South Of The Equator’) and those along with the other nine, will transport you to your childhood when you played cricket in the backyard and Bing Crosby was your parent’s vinyl of choice for the only day of the year that you had to be kind to nasty aunt Madge. Unique arrangements give each track a spicy feel. Slip on ‘Oh Come All Ye Faithful’ and rock out (in your best Hawaiian shirt) to what once was a pious and very serious number. Grab your surfboard and pretend you’re catching a Christmas wave to the ‘beachy’ twang of ‘Little Drummer Boy’. 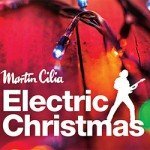 Electric Christmas captures the feel of an Australian summer and our unorthodox but relaxed Xmas vibe perfectly. This year your Santa day won’t be complete without a shrimp on the barbie, a beer in the Esky, a rerun on the telly, a nanna nap on the couch and a touch of Cilia’s surf rock sailing through the iPod. Watch the video for Oh Come All Ye Faithful.